Far beyond the Kolvarian Wastes lies a dark and depopulated sector known as the Chelicerian Abyss. All probes to enter the Abyss vanished without a trace, and any deep space vessel to stray beyond the Wastes was never heard from again. Seventy years ago, a joint task force of Metahumans, Neo-Elves, and Sulf-Orcs ventured into the Abyss in strength, intending to secure the sector and harvest whatever dark energy lay within. As the vanguard emerged from internodal space, a shimmering rift appeared, belching forth a writhing swarm of legs and iridescent energy. 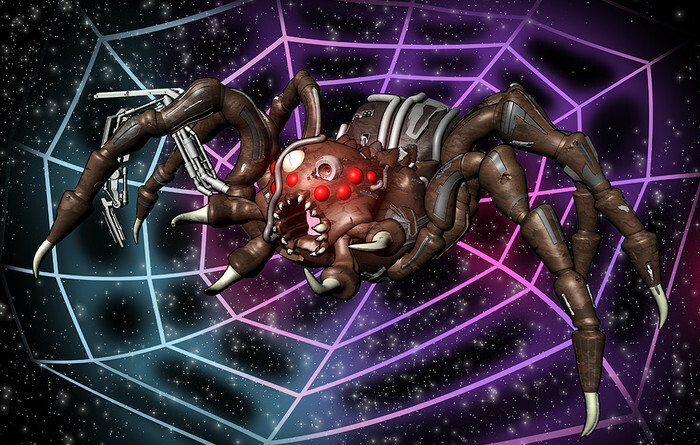 The creatures ensnared the vessels in phasic webbing and devoured their energy and metallic components. As a few ragged survivors limped home, they were relentlessly pursued by a swarm of the ravenous technovores. Tearing open a phasic rift in orbit of Danara VI, the creatures consumed the world, digesting its cities and mountains, and feasting on the planet's metallic core. Only the combined efforts of the neighboring star systems managed to drive the gorged technovores from the remains of Danara and destroy them. It has been seven decades since the Consumption of Danara, but the technovores remain a real if distant threat. The Chelicerian Abyss has been quarantined by all galactic governments lest the creatures are disturbed once more, but travelers in the Wastes have reported increased sightings in recent years, and many fear that another infestation is only a matter of time. Technovore swarms are coordinated by a hivemaster, who relays psychic transmissions between the swarm and the distant Technovore Queen. Hivemasters represent a regional locus of control for an infestation, but are rarely encountered except in sectors thoroughly dominated by the Technovores.